The European Commission provides a platform to settle disputes online (OS). You can find this platform at the following link: https://ec.europa.eu/consumers/odr/. Consumers can use this platform to settle their disputes from online contracts. .
We will not participate in alternative processes to settle disputes in the sense of § 36 VSBG. The use of an alternative office of arbitration is not an overriding prerequisite for calling on the regular courts responsible. Unless stated otherwise, the contents of www.actuarial-academy.com are protected by copyright. Unless produced ourselves, photographs used are marked with image credits or listed below. The use of photographs on third-party pages is only possible in the context of a license from the copyright holder. Any software that may be downloaded from this website is licensed subject to the terms of the applicable license agreement. Except for rights granted pursuant to such license agreement, EAA and its licensors reserve all intellectual property rights, title and interest in such software. This website contains information concerning various third parties (often referred to as "partners") who offer products or services compatible with EAA products. This information is provided for your convenience only. EAA is not responsible for and does not warrant any third party product or service or the accuracy of any description. EAA provides certain links to other websites as a convenience to you. EAA does not monitor nor control the content of any other website and assumes no responsibility or liability of any kind for any material or communications available at such websites. EAA is not responsible for the content of any site that may be linked to EAA website. Information on this website may contain factual inaccuracies or typographical errors or be incomplete or out of date. Information may be changed or updated without notice. EAA may make changes and/or improvements in the contents described in this website at any time without notice. EXCEPT AS OTHERWISE EXPRESSLY PROVIDED IN A WRITTEN AGREEMENT BETWEEN YOU AND EAA, ALL MATERIALS PROVIDED AT THIS WEBSITE ARE PROVIDED "AS IS" AND WITHOUT ANY WARRANTIES OF ANY KIND, INCLUDING WARRANTIES OF MERCHANTABILITY, FITNESS FOR A PARTICULAR PURPOSE, AND NONINFRINGEMENT. IN NO EVENT SHALL EAA BE LIABLE FOR ANY DIRECT, INDIRECT, INCIDENTIAL, SPECIAL OR CONSEQUENTIAL DAMAGES OR DAMAGES FROM BUSINESS INTERRUPTION OR LOSS OF PROFITS, REVENUE, DATA OR USE, INCURRED BY YOU OR ANY THIRD PARTY, WHETHER BASED ON WARRANTY OR IN CONTRACT, TORT, OR OTHER LEGAL THEORY, AND WHETHER OR NOT ADVISED OF THE POSSIBILITIES OF SUCH DAMAGES, ARISING FROM YOUR ACCESS TO, OR USE OF, THIS WEBSITE OR ANY OTHER HYPERLINKED WEBSITE, EVEN IF EAA HAS BEEN ADVISED OF THE POSSIBILITY OF SUCH DAMAGES. Your registration is binding. Cancellation is only possibly up to 4 weeks before the first day of seminar. If you cancel at a later date, the full seminar fee is due. You may appoint someone who takes your place, but must notify us in advance. Payment must be effected 4 weeks before the event. Please always give your invoice number when you effect payment. Bank charges must be borne by the participant. EAA has the right to cancel the event if the minimum number of participants is not reached. We are delighted that you have visited our Internet site www.actuarial-academy.com and are pleased by your interest in our company. We take the protection of your personal data very seriously. Personal data are information about the personal or factual circumstances of an identified or identifiable, natural person. These include the civilian name, address, telephone number and the date of birth, although also all other data that can be assigned to an identifiable person. As personal data enjoy special protection under law, they are only recorded by us if this is necessary for the provision of our Internet site and the promotion of our services. We explain to you below which personal information we record during your visit to our Internet site and how we use these data. Our data protection policy conforms to legal regulations, in particular those of the Federal Act on Data Protection (BDSG), the Telemedia Act (TMG) and the EU’s General Data Protection Regulation (GDPR). We will solely record, process and save your personal data insofar as this is required to provide the proper functions of this Internet site and our contents and services, although also to answer your inquiries and, if appropriate, to process orders / contracts, but only insofar as a justified interest exists for this in the sense of Art. 6 Para. 1 P.1 Letter f GDPR or some other permitting circumstance. We only use your data for further-going purposes determined exactly in the consent, e.g. for sending promotional information by newsletter, if you have issued your consent separately beforehand. Websites and resources (images, files, other page contents) called-up from our Internet site. These data are stored in our system’s log files. These data are not merged with the personal data of an actual user, so that it is not possible to identify individual visitors to the site. Art. 6 Para.1 Letter f GDPR (justified interest). Our justified interest is in ensuring that the objective described below is achieved. Logging is performed to retain the compatibility of our Internet site for all visitors, if possible, to combat misuse and to rectify disturbances. In this respect, it is necessary to log the technical data of the accessing computer in order to react at the earliest possible stage to depiction errors, attacks on our IT systems and/or errors in the proper functioning of our Internet site. In addition, the data serve the purpose of optimising the website and of generally ensuring the security of our technical information systems. The aforesaid technical data are deleted as soon as they are no longer required to ensure the compatibility of the Internet site for all visitors, although at the latest 3 months after our Internet site has been called-up. The registration and log-in data that you enter to us. On our Internet site, you have the opportunity to use a separate log-in area. If you have forgotten your password or your user name for this area, there is an opportunity to resend these data after entering your contact data (e-Mail address) beforehand. The usage data arising in the context of use of the log-in area are only recorded, saved and processed by us to combat misuse, to rectify disturbances and to retain proper functioning. These data are not used for other purposes or forwarded to third parties. Your assessment is saved without limit by time and published. We reserve the right of deletion without having to state reasons and without previous or subsequent information. The data recorded in the course of the 'Forgotten user name or password' function are only used for resending the forgotten access data. The options of objection and rectification are governed by the general regulations on the right of objection and the claim to deletion under data protection law described below in this declaration of data protection. When this Internet site or individual files on the Internet site are called-up, we record, process and save the following data: IP address, the web site from which the file was called-up, the name of the file, the date and time of call-up, the data volume transmitted and a message concerning the success of the call-up (web log). We use these access data solely in a non-personalised form in order to constantly improve our Internet services and for statistical purposes. We deploy the web tracking service offered by Google Ireland Limited, Gordon House, Barrow Street, Dublin 4, Irland (referred to below as Google Analytics) on our website. In the context of this web tracking, Google Analytics deploys cookies. These are saved on your computer and enable the use of our website and your surfing behaviour to be analysed (so-called tracking). We perform this analysis on the basis of the tracking service offered by Google-Analytics, in order to continuously optimise our Internet presence and to improve its availability. In the course of use of our web site, data (in particular, your IP address and your user activities) are transmitted to a server of Google LLC, where they are processed and stored outside the European Union, e.g. in the USA. The EU Commission has established that a reasonable level of data protection can exist in the USA, if the data processing enterprise is subject to the US-EU Privacy Shield Treaty and the data are exported reliably to the USA in this way. By activating IP anonymisation in the Google-Analytics tracking code of this Internet page, your IP address is anonymised by Google Analytics before transmission. This website uses a Google Analytics tracking code extended by the operator gat._anonymizeIp(). This ensures anonymised recording of IP addresses (IP masking). Art. 6 Para.1 Letter a GDPR (consent), either in the context of registering with Google (opening a Google account and accepting the data privacy notices posted there) or, if you have not registered with Google, through your explicit consent by opening our site. Working on our behalf, Google uses this information to evaluate your visit to this Internet site, to compile reports about the web site activities and to provide further services for us that are connected with use of the web site and of the Internet. The IP address transmitted by your browser in the course of Google Analytics is not merged with other data of Google LLC. Google stores the data relevant to the provision of the web tracking service as long as is necessary to fulfil the web service booked. Data are recorded and saved in an anonymised manner. The data are deleted without delay if a reference to a person exists, unless the person falls under the legal duties of retention. In any case, data are deleted after the retention period has expired. We deploy active Java script contents from external providers on our Internet site, so-called web services. By calling-up our Internet site, these external providers may receive personal information about your visit to our Internet site. This may mean that data are processed outside the EU. You can prevent this, in that you install a Java script blocker, such as the browser plug-in 'NoScript' (www.noscript.net) or de-activate Java script in your browser. However, this may mean that functions on the Internet sites you visit are impaired. A web service from Website-Check GmbH, Beethovenstraße 24 in 66111 Saarbrücken, DE (referred to below as website-check.de) loaded onto our site. We use these data to ensure the full functionality of our website. In this context, your browser may transmit personal data to website-check.de. The legal basis for processing the data is Art. 6 Para.1 Letter f GDPR (justified interest). Our justified interest is that our Internet site functions faultlessly. Data are deleted as soon as the purpose of their recording has been fulfilled. Further information about how the transmitted data are handled can be found in the data protection policy of website-check.de: https://www.website-check.de/datenschutzerklaerung/. You can prevent your data being recorded and processed by website-check.de, in that you de-activate execution of script code in your browser or install a script blocker in your browser (for example, these can be found at www.noscript.net or www.ghostery.com). A web service offered by Google Ireland Limited, Gordon House, Barrow Street, Dublin 4, Irland (referred to below as Double-click) is loaded onto our website. We use these data to ensure that our website is fully functional. In this context, your browser may transmit personal data to Double-click. The legal basis for processing the data is Art. 6 Para.1 Letter f GDPR. Our justified interest is that our Internet site functions faultlessly. Double-click has certified itself under the EU-US Privacy Shield Treaty (see https://www.privacyshield.gov/list). Data are deleted as soon as the purpose of their recording has been fulfilled. Further information about how the transmitted data are handled can be found in the data protection policy of Double-click: https://policies.google.com/privacy. You can prevent your data being recorded and processed by Double-click, in that you de-activate execution of script code in your browser or install a script blocker in your browser (for example, these can be found at www.noscript.net or www.ghostery.com). A web service offered by Google Ireland Limited, Gordon House, Barrow Street, Dublin 4, Irland (referred to below as Google) is loaded onto our website. We use these data to ensure that our website is fully functional. In this context, your browser may transmit personal data to Google. The legal basis for processing the data is Art. 6 Para.1 Letter f GDPR. Our justified interest is that our Internet site functions faultlessly. Google has certified itself under the EU-US Privacy Shield Treaty (see https://www.privacyshield.gov/list). Data are deleted as soon as the purpose of their recording has been fulfilled. Further information about how the transmitted data are handled can be found in the data protection policy of Google: https://policies.google.com/privacy. You can prevent your data being recorded and processed by Google, in that you de-activate execution of script code in your browser or install a script blocker in your browser (for example, these can be found at www.noscript.net or www.ghostery.com). A web service offered by Google Ireland Limited, Gordon House, Barrow Street, Dublin 4, Irland (referred to below as Google Video) is loaded onto our website. We use these data to ensure that our website is fully functional. In this context, your browser may transmit personal data to Google Video. The legal basis for processing the data is Art. 6 Para.1 Letter f GDPR. Our justified interest is that our Internet site functions faultlessly. Google Video has certified itself under the EU-US Privacy Shield Treaty (see https://www.privacyshield.gov/list). Data are deleted as soon as the purpose of their recording has been fulfilled. Further information about how the transmitted data are handled can be found in the data protection policy of Google Video: https://policies.google.com/privacy. You can prevent your data being recorded and processed by Google Video, in that you de-activate execution of script code in your browser or install a script blocker in your browser (for example, these can be found at www.noscript.net or www.ghostery.com). A web service offered by Google Ireland Limited, Gordon House, Barrow Street, Dublin 4, Irland (referred to below as Google APIs) is loaded onto our website. We use these data to ensure that our website is fully functional. In this context, your browser may transmit personal data to Google APIs. The legal basis for processing the data is Art. 6 Para.1 Letter f GDPR. Our justified interest is that our Internet site functions faultlessly. Google APIs has certified itself under the EU-US Privacy Shield Treaty (see https://www.privacyshield.gov/list). Data are deleted as soon as the purpose of their recording has been fulfilled. Further information about how the transmitted data are handled can be found in the data protection policy of Google APIs: https://policies.google.com/privacy. You can prevent your data being recorded and processed by Google APIs, in that you de-activate execution of script code in your browser or install a script blocker in your browser (for example, these can be found at www.noscript.net or www.ghostery.com). A web service offered by Google Ireland Limited, Gordon House, Barrow Street, Dublin 4, Irland (referred to below as Googletagmanager.com) is loaded onto our website. We use these data to ensure that our website is fully functional. In this context, your browser may transmit personal data to Googletagmanager.com. The legal basis for processing the data is Art. 6 Para.1 Letter f GDPR. Our justified interest is that our Internet site functions faultlessly. Googletagmanager.com has certified itself under the EU-US Privacy Shield Treaty (see https://www.privacyshield.gov/list). Data are deleted as soon as the purpose of their recording has been fulfilled. Further information about how the transmitted data are handled can be found in the data protection policy of Googletagmanager.com: https://policies.google.com/privacy. You can prevent your data being recorded and processed by Googletagmanager.com, in that you de-activate execution of script code in your browser or install a script blocker in your browser (for example, these can be found at www.noscript.net or www.ghostery.com). A web service offered by Google Ireland Limited, Gordon House, Barrow Street, Dublin 4, Irland (referred to below as gstatic) is loaded onto our website. We use these data to ensure that our website is fully functional. In this context, your browser may transmit personal data to gstatic. The legal basis for processing the data is Art. 6 Para.1 Letter f GDPR. Our justified interest is that our Internet site functions faultlessly. gstatic has certified itself under the EU-US Privacy Shield Treaty (see https://www.privacyshield.gov/list). Data are deleted as soon as the purpose of their recording has been fulfilled. Further information about how the transmitted data are handled can be found in the data protection policy of gstatic: https://policies.google.com/privacy. You can prevent your data being recorded and processed by gstatic, in that you de-activate execution of script code in your browser or install a script blocker in your browser (for example, these can be found at www.noscript.net or www.ghostery.com). A web service offered by Google Ireland Limited, Gordon House, Barrow Street, Dublin 4, Irland (referred to below as YouTube) is loaded onto our website. We use these data to ensure that our website is fully functional. In this context, your browser may transmit personal data to YouTube. The legal basis for processing the data is Art. 6 Para.1 Letter f GDPR. Our justified interest is that our Internet site functions faultlessly. YouTube has certified itself under the EU-US Privacy Shield Treaty (see https://www.privacyshield.gov/list). Data are deleted as soon as the purpose of their recording has been fulfilled. Further information about how the transmitted data are handled can be found in the data protection policy of YouTube: https://policies.google.com/privacy. You can prevent your data being recorded and processed by YouTube, in that you de-activate execution of script code in your browser or install a script blocker in your browser (for example, these can be found at www.noscript.net or www.ghostery.com). A web service offered by Google Ireland Limited, Gordon House, Barrow Street, Dublin 4, Irland (referred to below as ytimg) is loaded onto our website. We use these data to ensure that our website is fully functional. In this context, your browser may transmit personal data to ytimg. The legal basis for processing the data is Art. 6 Para.1 Letter f GDPR. Our justified interest is that our Internet site functions faultlessly. ytimg has certified itself under the EU-US Privacy Shield Treaty (see https://www.privacyshield.gov/list). Data are deleted as soon as the purpose of their recording has been fulfilled. Further information about how the transmitted data are handled can be found in the data protection policy of ytimg: https://policies.google.com/privacy. You can prevent your data being recorded and processed by ytimg, in that you de-activate execution of script code in your browser or install a script blocker in your browser (for example, these can be found at www.noscript.net or www.ghostery.com). A seal of approval of the company Website-Check GmbH, Beethovenstraße 24 in 66111 Saarbrücken, DE (hereinafter: website-check.de) is downloaded from our site. We incorporate this seal of approval in order to include it on our website to show that we take the subject of "data protection" seriously. Due to the integration of the Website-Check test seal, non-personal data is transferred to Website-Check GmbH as the publisher of the test seal. In this context, the latter only receives your IP address in order to be able to deliver the image file of the test seal. Your IP address has no personal reference for Website-Check GmbH. The legal basis for data processing is Art. 6 Para. 1 lit. f DSGVO (justified interest). The legitimate interest consists in enabling the error-free display of the website check test seal on the website. Further information on the handling of the transferred data can be found in the data protection declaration of website-check.de: https://www.website-check.de/datenschutzerklaerung/. You can prevent the reloading of the website check seal and thus the transfer of your IP address (anonymous for Website-Check GmbH) to Website-Check GmbH,, in that you de-activate execution of script code in your browser or install a script blocker in your browser (for example, these can be found at www.noscript.net or www.ghostery.com). We deploy cookies on different pages to enable the use of certain functions on our website. Cookies are small text files, which can be deposited on your computer by your browser. These text files contain a characteristic sequence, which allows the browser to be uniquely identified if our website is called up again. The process of depositing a cookie file is also called 'placing a cookie'. Art. 6 Para.1 Letter f GDPR (justified interest). Our justified interest is that the full functionality of our Internet site is retained, user-friendliness is raised and customers can be addressed individually. We can identify individual visits to the site with the help of cookie technology only if the site visitor has disclosed the relevant personal data to us beforehand on the basis of a separate consent. Our cookies are saved until they are deleted in your browser or, if a session cookie is concerned, until the session has ended. You can yourself determine the settings in your browser so that the placing of cookies is generally prevented, that you receive a message about this, decide whether to accept cookies on a case-by-case basis or to accept cookies as a matter of principle. Cookies can be deployed for various purposes, for example, to recognise that your PC has linked to our web presence before (permanent cookies) or to save the offers last viewed (session cookies). We deploy cookies to offer you a higher level of user comfort. In order to benefit from our comfort functions, we recommend that you accept cookies for our web presence. The options of objection and rectification are otherwise governed by the general regulations on the right of objection and the claim to deletion under data protection law described below in this declaration of data protection. Your personal data are protected by technical means and organisational measures during their recording, saving and processing in such a way that they cannot be accessed by third parties. We cannot warrant complete data security along the transmission path to our IT systems for communications by e-Mail that have not been encrypted. We therefore recommend that information with a high degree of secrecy is encrypted or sent by post. You have the right that we make available to you the data concerning your person which you have transmitted to us in a structured, common and machine-readable format. You may also request that we transfer this data to a third party immediately on your first instruction, provided that the processing is based on a consent pursuant to Art. 6 para. 1 lit. a DSGVO or Art. 9 para. 2 lit. a DSGVO or on a contract pursuant to Art. 6 para. 1 lit. b DSGVO and the processing is carried out by us within the framework of automated data processing. If you suspect that your data have been illegally processed on our site, you can naturally initiate clarification of the matter by a court at any time. Apart from this, you also have the opportunity to object to a supervisory authority. You accrue the right of complaint in the EU Member State of your normal residence, your workplace and/or the place of the alleged violation, i.e. you can choose to contact the supervisory authority at the aforesaid places. The supervisory authority to which you have complained will keep you updated on the status of their enquiries and the results, including the option of initiating a legal remedy under Art. 78 GDPR. 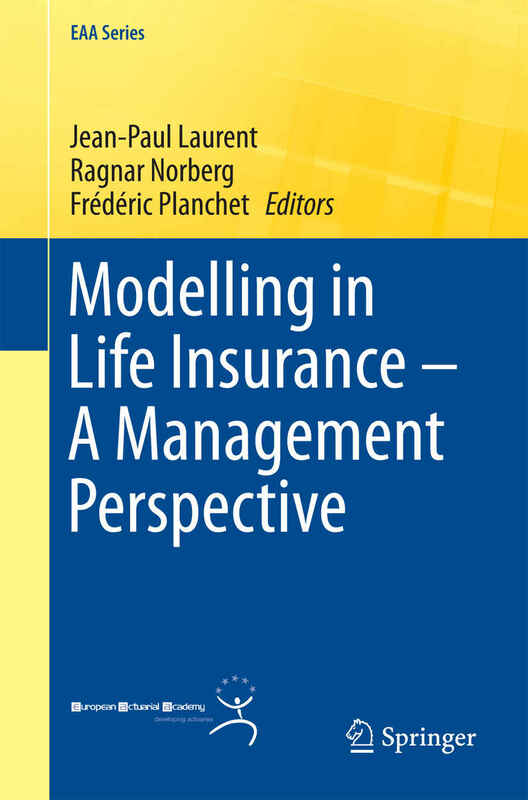 Explores a broad range of aspects of modelling in modern life insurance. The book provides views and objectives of the top management of insurance companies.